Forum Description: Stamp designer? Trader? Advertise your products here! It's been a while since posting on the forum but we are back! 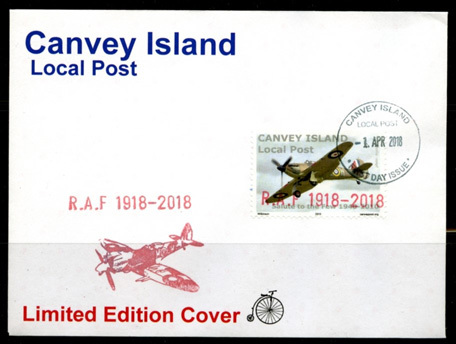 Local Post stamp collectors will be pleased to hear of the imminent release of several new single and multiple stamp sets for the second half of 2017, from the Canvey Island LP. Stamp images will be posted after each release date. 21st August: The first stamp set of 2017 is part of a four set series covering "Endangered Fauna and Flora of Canvey Island", starting with a four stamp set featuring Insects. 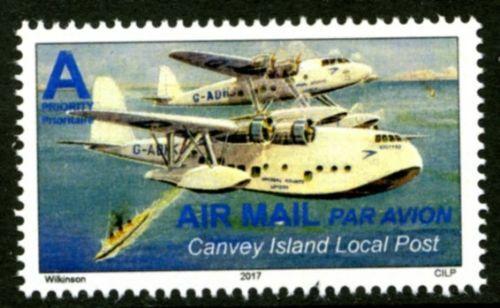 4th September: Due to increasing interest in CILP stamps from overseas, a vintage postcard scene featuring seaplanes will be released as our first Air Mail 'Priority' stamp. 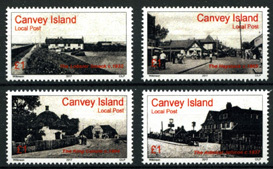 14th October: A four stamp set featuring Famous Public Houses of Canvey Island, which have been central to island community life. 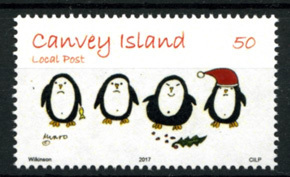 27th November: To round off the postal year, we have secured an original Christmas drawing from cartoonist Paul Munro to adorn an Xmas 2017 reduced rate seasonal stamp. Collectors are advised to obtain their copies from our agent, https://www.ebid.net/uk/stores/Alpha-Thematics/CINDERELLA/Local-Posts" rel="nofollow - Alpha Thematics , as soon as possible after release. The Public Houses and Xmas 2017 issues are very short print runs. For news, history and background information on the C.I.L.P., visit the https://canveyislandlocalpost.blogspot.com" rel="nofollow - Canvey Island Local Post blog. Our latest stamp issue depicts rare insects found at the SSSI site at Canvey Wick on Canvey Island. Available from Alpha Thematics via the link below. New stamp issued today. The design features an Imperial Airways Empire Flying-Boat with piggy-back S-20 mail carrier. This image appeared as a generic front-end of a multiview postcard c.1938. Seaside towns would order fold-out views of their area to be attached and a overprinted title on the front image. In this case the original card was overprinted with "Flying high with views over Canvey Island". The release date of our four stamp set featuring Famous Public Houses of Canvey Island, has been re-scheduled for 23rd October (originally 14th). Canvey Island Local Post (CILP) released it's Famous Public Houses stamp issue on the 23rd October, 2017. 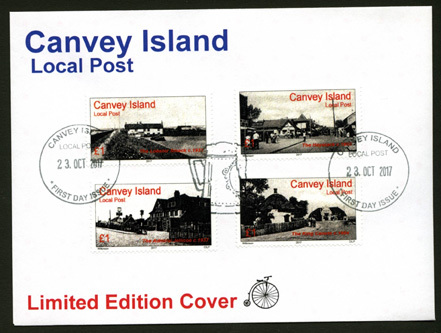 It is a four horizontal stamp set featuring Canvey Island 'pubs' that have played a defining role in community life for many decades and in one case, centuries. The 'pubs' featured in a stylised pencil sketch style are; the Haystack, the Admiral Jellicoe, the King Canute (prior to the 1953 flood known as the Red Cow), and the Lobster Smack. The latter was used by Charles Dickens as the Ship Inn in his 1861 novel Great Expectations. All the other pubs have their own stories and history, both good and bad. With the imminent demolition and re-development of the Admiral Jellicoe and the closure of the King Canute (formerly Red Cow), it is poignant and timely that the CILP should release this long planned stamp set now. Unfortunately, it was necessary to omit equally famous or well known pubs and drinking clubs from this issue, such as the old Oysterfleet, the Canvey Club (featured on a vinyl LP cover by R&B band Dr Feelgood), and younger establishments such as the Windjammer of the 1980s, and the Silver Jubilee from 1977. We hope to include these in a future stamp issue. On 27th November the CILP released its first dedicated Christmas stamp. It features an original cartoon by https://paulmunrocartoons.blogspot.com" rel="nofollow - Paul Munro . Limited Edition of 75 stamps only. Note: no FDCs or FDI postcards have been released. To commemorate HM Queen Elizabeth II accession to the throne on 6 February 1952, and to recognise The Queen's dedication to the service of the United Kingdom and Commonwealth, the CILP has issued a set of five se-tenant stamps on 6 February 2018. Entitled, "Queen Elizabeth II - Life & Service", the stamps show four portraits from HM The Queen's life from 1928 to 2013. A fifth stamp bears her Armorial Banner, often referred to as the Royal Standard. Across the base of the stamps is a quote from HM The Queen's accession oath; "The things which I have here before promised, I will perform and keep." Only 84 sets have been produced as a se-tenant strip with full perforations and gum. Each stamp measures approximately 31x31mm. A very limited edition of First Day Covers and FDI postcards have been produced (due to technical and aesthetic reasons the se-tenant strip has been broken to accommodate hand applied FDI cancellations). To commemorate the centenary of the formation of the Royal Air Force on 1st April, 1918, the CILP has issued a single stamp on 1st April, 2018. The stamp showing a WWII veteran Hurricane was originally issued in 2010 to commemorate the Battle of Britain. It is being re-issued bearing a handstamped red overprint legend “R.A.F 1918-2018”. Only 22 overprinted stamps have been issued, each stamp is approximately 30x40mm. A limited edition of 5 Commemorative Covers has also been produced. Originally a new stamp design was planned for this commemoration but due to emergency eye surgery, the project was cancelled. However, the event could not go unmarked by the CILP and the use of the Hurricane stamp seemed appropriate. Discovered retina had become detached and luckily whipped in for a very interesting (but hopefully not to be repeated) operation. Recovering slowly but prognosis good. Recovering slowly but prognosis good. I'm pleased to hear it Paul, best of luck. The Canvey Island Local Post is pleased to announce the release of new stamps this autumn commemorating three major anniversaries in UK history. The National Health Service was established in 1948 and has changed the lives of generations of Britons. The service continues to offer health care 'from cradle to grave' and although under increasing pressure, remains the flagship institution of social achievement and national pride. This limited edition of 240 stamps features the man behind the NHS; ex-coal miner and Labour government minister Aneurin Bevan. Alongside his profile is a quote from the man himself which remains even more poignant and relevant today. A limited number of FDC's have been issued. The CILP is proud to announce the release of this limited edition of 80 stamps to salute the struggle of Suffragists and Suffragettes to achieve women's suffrage. Not only does this stamp commemorate women's struggle in the nineteenth and twentieth centuries, but also acknowledges the continuing fight to achieve women's rights and equality in the UK and worldwide in the 21st century. 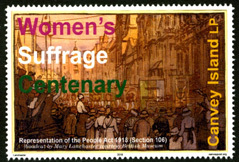 This is a large format stamp of 79 mm x 54 mm and features a woodcut by Mary Lanchaster of a Suffragette march in 1918. FDC's have also been issued. This unique commemoration on the 100th anniversary of the signing of the Armistice recognises the significance of the end of the First World War, and the sacrifice made by so many men and women during the war. Our stamp reflects the solemnity of the event with a stylised yet traditional red poppy. The legend, "Lest We Forget"', refers to the often quoted phrase on Remembrance Day. Limited edition of 150 stamps. First Day Covers and postcards have also been released in small numbers. All our anniversary stamps and associated philatelic items will be available from https://www.ebid.net/uk/stores/Alpha-Thematics/CINDERELLA/Local-Posts" rel="nofollow - from 12th November, 2018, subject to stock.